This is a Updated version of the Golden Rules. Includes NEW Cleaner Textures and Material Files. 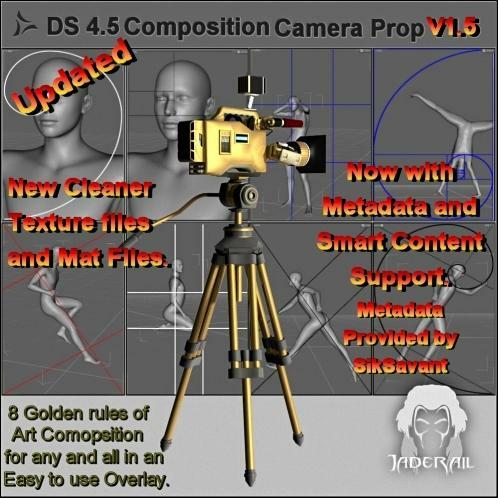 NOW with Metadata for use in the Smart Content Tab in Daz Studio 4.5.1.56. This is a DS 4.5 only Camera Prop. It is not compatable with any DS Version below 4.5. It creates a Golden Rules of Art Composition Overlay for easy set up of images for 3D artist. shmutz55 (3 months ago) Inappropriate? Infinityseed (1 year ago) Inappropriate? mwright (2 years ago) Inappropriate? zodias90 (2 years ago) Inappropriate? Nakiloe (3 years ago) Inappropriate? be a great help to me. Cheers. ellebasi (3 years ago) Inappropriate? Pixelsucher (4 years ago) Inappropriate? Nightwyrm (4 years ago) Inappropriate? SilentWinter (5 years ago) Inappropriate? Just getting back into DS with version 4 - this is a must have for me so thank you very much. vtech (5 years ago) Inappropriate? firewarden (6 years ago) Inappropriate? Saiyaness22 (6 years ago) Inappropriate? Fatbear (6 years ago) Inappropriate? Thanks for this creation, really nice! bullit35744 (6 years ago) Inappropriate? Thank you Jaderail for directing me to this ! !I really appreciate your help. Thank you for directing me to this !! Thank you Jaderail. I use this on all the time. Thanks, it's guys like you that really help gnubs like me. Thanks, it's guys like you that really help us gnubs. Jaderail (6 years ago) Inappropriate? Thank you all for looking at my little effort. I hope you find it useful. Callad (6 years ago) Inappropriate? RAMWolff - RAMWorks (6 years ago) Inappropriate? SpyroRue (6 years ago) Inappropriate? Chance (6 years ago) Inappropriate? JeanneM (6 years ago) Inappropriate? Thanks for this. An excellent idea. EbruKash (6 years ago) Inappropriate? Thank you all, I hope you all find it useful. Kimh (6 years ago) Inappropriate? Josea (6 years ago) Inappropriate? Something like this would be nice for Poser too. Thank you, Jaderail. This will really help my composition. Wonderful! Thank you very much. This will come in handy. willowfan (6 years ago) Inappropriate? You got to be kidding, I follow you Joe. Thank you much. joequick (6 years ago) Inappropriate? Welcome Budo-san, enjoy. Lets see some renders. Budo-san (6 years ago) Inappropriate? Thank you Jaderail, very nice! Thank you KickAir. I also thank you for your Feedback on the Forums. KickAir 8P~ (6 years ago) Inappropriate?